The U.S. Department of Justice is currently attacking the Second Amendment by fiat while constantly denying its abuses despite clear evidence to the contrary. Yesterday we revealed that the Justice Dept. is causing banks to fear doing business with legal gun dealers due to Operation Choke Point, a joint program between the DOJ, FDIC and the Consumer Financial Protection Bureau targeting “high-risk activities,” of which firearm sales is also listed. “And it’s working – payments companies across the country are cutting off service to categories of merchants that – although providing a legal service – are creating the potential for significant financial and reputational harm as law enforcement publicizes its activities,” he added. Last month, BitPay, a U.S.-based bitcoin processor, refused to do business with gun dealer Michael Cargill of Central Texas Gunworks due to its Terms of Service which excludes merchants involved in firearm sales, ponzi schemes, “get rich quick” programs, “money service businesses” (such as payday loans), gambling and others which are all listed in the FDIC document. Prominent financial experts have, however, come out and opposed the program, such as Frank Keating, the CEO of the American Banker Associated, who explained his opposition to the program in the Wall Street Journal. Last August, 31 members of Congress became aware of Operation Choke Point and sent a letter to the Justice Dept. asking for information on the program, stating that it “has come to our attention that the DOJ and the FDIC are leading a joint effort that according to a DOJ official is intended to ‘change the structures within the financial system … choking [online short-term lenders] off from the very air they need to survive,'” in reference to payday lenders listed as a “high-risk activity” alongside firearm sales in the FDIC document. They also warned that the agencies were acting outside of their congressional mandate and without statutory authority. The DOJ, however, refused to answer any questions about the program. But Justice Dept. trial attorney Joel M. Sweet provided specific details on the program during a FDIC-sponsored presentation to bank examiners, which clearly indicates that both the DOJ and FDIC are scrutinizing firearm sales so severely that banks will shy away from the burdensome demands as Oxman indicated. Holder has only increased such rhetoric since then and is undoubtedly one of the most anti-gun politicians inside the beltway. Only a few weeks ago, for example, he suggested that gun owners should be forced to wear “smart gun” bracelets, which would render firearms much less reliable in defensive use. Holder is also one of the most corrupt bureaucrats as well. When his unconstitutional abuses are exposed, it is common for Holder to deny that they are taking place, even if the evidence is in plain view. 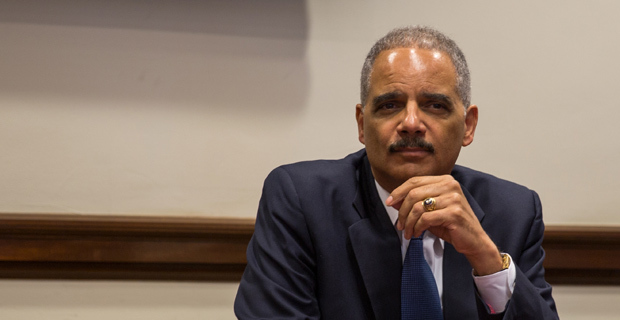 For one, Holder denied the cover-up behind Operation Fast and Furious, the DOJ program in which the Bureau of Alcohol, Tobacco and Firearms purposely allowed firearms to end up in the hands of Mexican drug cartels in a failed effort to catch them. But he was later held in contempt of Congress for refusing to release thousands of internal Justice Dept. documents in response to a subpoena. Even President Obama invoked executive privilege to prevent the documents from being released. Holder also denied knowing that a top Obama supporter, DOJ trial attorney Barbara Bosserman, was leading the investigation into the IRS targeting of conservative groups despite the fact that Bosserman visited the White House for over seven hours. An anonymous Justice Dept. source told Fox News that it was “extraordinary” for the White House to specifically invite a career employee to come visit the president and that her attendance had to be cleared by higher-ups at the DOJ. And in the DOJ’s persecution of journalist James Rosen, Holder said that he wasn’t involved in the “potential prosecution of the press for the disclosure of material,” even though his own department confirmed that Holder approved the search warrant for Rosen’s emails. It is a common tactic for the corrupt to keep repeating lies and denying their abuses over and over again until they appear to be honest, especially to the mainstream media. “If you tell a lie that’s big enough, and you tell it often enough, people will believe you are telling the truth, even when what you are saying is total crap,” author and actor Richard Belzer wrote.